Founder of Fungi Perfecti and Host Defense Organic Mushrooms, and has been a dedicated mycologist for over thirty years. Over this time, he has discovered and coauthored new species of mushrooms, received nine patents, written six books and pioneered countless techniques in the field of edible and functional food mushroom cultivation. Two of his books, Growing Gourmet & Medicinal Mushrooms and The Mushroom Cultivator have been heralded as the ‘bibles’ of the mushroom industry. His latest book, Mycelium Running, How Mushrooms Can Help Save the World, has propelled his vision of using mushrooms to help save ecosystems and improve population health to the world stage. He is a TED and TEDMED speaker. Currently he is working with the CDC (Center for Disease Control and Prevention) and NIH (National Institutes of Health/Virology), as well as with other universities on a variety of research projects. Paul’s philosophy is that biodiversity is biosecurity. He sees the ancient Old Growth forests of the Pacific Northwest as a resource of incalculable value, especially in terms of its fungal genome. A dedicated hiker and explorer, his passion is to preserve and protect as many ancestral strains of mushrooms as possible from these pristine woodlands. He funds research to save rare strains of mushrooms that dwell within the old growth forests. 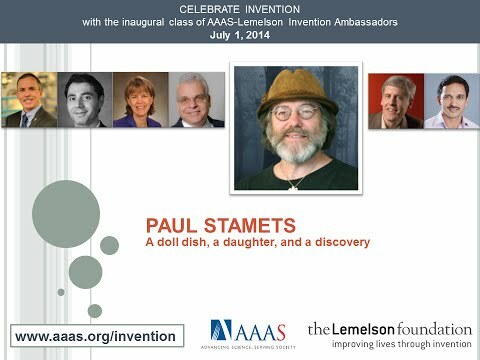 Paul has received numerous awards and honors for his contributions to the science of medicinal mushrooms and ecology. His TED (2008) talk “How Mushrooms Can Help Save the World” has been rated in the top 10 of all TED talks, and viewed more than >2.6 million times. His TEDMED (2011) introduced medicinal mushrooms to more than 800 physicians. Both TED and TEDMED talks have received 99% positive reviews on youtube.com. In January of 2014, Paul received the highly acclaimed NAMA (North American Mycological Association, www.namyco.org) award for expanding the field of mycology for both amateurs and professionals. Could a Mushroom Save a Honeybee?